I love little wooden Japanese kokeshi dolls. I don't know much about them, but I often linger outside gift shop windows gazing at them. I'm not sure what it is - their simplicity? Shape? Style? So I snapped up a copy of Yumi when it came my way. 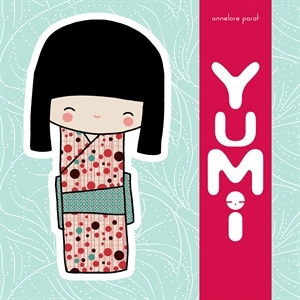 Yumi is a children's picture book by Annelore Parot, published by Hardie Grant Egmont (2010). Meet Yumi the youngest of the Kokeshi. She is adventurous and clever. She takes great pride in everything she does, and personifies the universe that artist Annelore Parot has created for her characters. She loves to dress up, go to school, go to parties and solve problems! Help Yumi to find the right Kimono to wear, and learn Jamanese phrases. Find Yumi's friends, and then choose an outfit for a dress-up party! Decide the best sushi for Yumi to eat and then fall into a Kokeshi filled dream! The first thing I loved about Yumi was the cover. It's so elegant. Pale green, padded, and with the cut-out of a kokeshi doll stitched to the front. The illustrations throughout maintain that elegance and Japanese style. I found myself touching each page with reverent fingertips, tracing over patterns in belts and kimonos, enjoying patterns and colours. It's important for kids to experience different cultures. Using a toy to snag their interest is a brilliant idea. Parot introduces some Japanese words, but the pictures show so many Japanese features - kimono patterns, signs, pictures of food, kites - ensuring that a dip into this children's picture book is a tiny introduction to Japan. Yumi also works as a puzzle book. Children are invited to explore, to unfold, to find a match, to turn different-sized pages, to find a lost pet etc. There isn't much of a storyline - just enough to link the activities together. But the book has so much to look at, and marvel about, and delight in! Can I be sexist and say little girls will just love this book? If you're looking for something special to put away for your daughter for Christmas, or you're a librarian searching for resources to supplement your material on Japan, I recommend Yumi. Read Susan Whelan's review of Yumi at KBR. Find more Children's Book Reviews on The Book Chook by clicking Reviews in the right sidebar.